is considered the most forceful of the available pincers against the low approach. 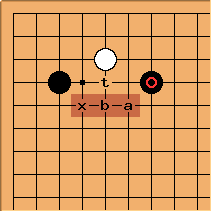 The reason is that if White plays tenuki, Black at t is obviously strong. The normal idea for White is to come out, with the interesting play at a daring Black to cut (3-4 point low approach one-space high pincer knight's move), or at b (3-4 point low approach one-space high pincer one space jump). The play at x is used against almost all other pincers, but isn't common against the high pincer. Next in popularity are the contact play c (3-4 point low approach one-space high pincer, contact underneath) and the counter-pincer d. Then come White e, tenuki, f and g. The play at h may have been invented by Karigane Junichi, and can transpose into a one-space low pincer variation when Black answers at c.
After , black can peep at a or play hane at b.
the hanekomi at b. Black will then atari with a, and after white stretches, defend the cut with one of the moves around c.
Jeff: A 5d that I talk to is always criticizing me for letting myself get sealed in. After black a, will white immediately play b to live, granting black the chance to seal him in around c? Or will white resist being sealed in by forgoing b so he can escape (hopefully in sente so he can come back to b)? Herman Hiddema Generally, white will immediately play b in that case. 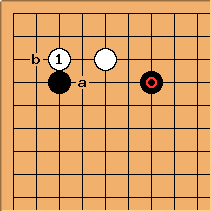 If black gets both a and b, the group will become weak, and therefore a target for attack. In this case, getting sealed in is ok. Firstly, because starting with already indicates that you are trying to settle your group quickly, if you did not want that, you would've played at c or some such move. 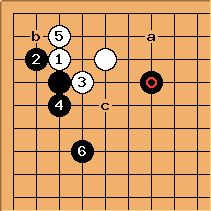 And secondly, because white has already gotten to play tenuki once (with ), despite this being black's corner to begin with. So white has gotten an extra move elsewhere in exchange. Because after Black cutting the white keima ends well placed as peep against White's connection. 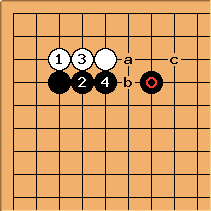 as a good peep against White's connection, White is forced to connect directly in bad shape. More discussion at BQM184.